How: A copy of this novel was provided by Weapenry Co-Op for review via Net Galley. Twenty years after prom queen Cassie Kennedy is brutally murdered, six teenagers break into the house where she was killed to hold a séance. Haven knows his cousin Elise only wants to scare the crap out of him and his friends, but he’s willing to put up with one of her pranks if it means a chance to spend a few hours with the new kid in town, Pierce Hunter. But when morning comes, Elise has disappeared without a trace. Twelve years later, Pierce and his twin brother Jordan are professional paranormal investigators, starring in their own ghost-hunting TV show. When Pierce calls Haven, insisting they return to the supposedly haunted building one last time, Haven reluctantly agrees. He’s nervous about seeing Pierce again, but he’s determined to get some answers. Did they really speak to Cassie’s ghost that night? What happened to Elise? And the biggest mystery of all – how did she know the secret of the well? The chapters in The Well alternate between the present, and twelve years ago. In the past the main character, Haven, is seventeen, which obviously makes him twenty nine in the present chapters. I think I may be a fan of books told in non-linear format because this is the second non-linear book I’ve read this year and I’ve really enjoyed both of the titles. With The Well the non-linear format worked really well to uphold the suspense and mystery. The alternating chapters between past and present gave insight into Haven as a person now, and also built up the suspense about what really happened that night at the haunted house. Now I’m not talking chilled to the bone creepy, but there were definitely elements of creepiness to The Well, especially in the past chapters where the group of teenagers were doing a séance and hunting ghosts in a haunted house. Whether or not there were actual ghosts or whether everything was a hoax played out by Haven’s cousin, Cassie, was left up in the air, which I think added to the creepiness. Were there ghosts? Or was it all just made up? I like to think that there were ghosts in this story. Because of half the book is told from Haven’s seventeen year old perspective and the other half told from his twenty nine year old perspective this book is a perfect cross-over between YA and adult. I think most readers of YA could easily sink their teeth into this one – the content in the present (adult) chapters is not anything you wouldn’t already find in a YA book. 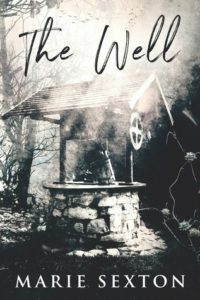 Even though The Well was largely a story about Haven’s missing cousin (and other things, but I’ll leave them for you to find out for yourself), there was a thread of romance in both timelines. Haven had a crush on Pierce when he was seventeen, but hasn’t spoken to him in twelve years. I liked how sweet this romance was and how, together, the two of them had to overcome what had happened twelve years ago. I especially loved how Pierce saw things in Haven that Haven himself didn’t see, and how patient he was with Haven. The Well is one of those books that makes you point fingers at everyone, and will never tell you if you’re right until the very end. I did end up guessing the mystery aspect, but it wasn’t straight off the bat by any means. Overall, I really enjoyed The Well! It was a creepy paranormal mystery that had me hooked from start to finish. OMG I know. I was like: you silly children. But it also made it feel like a good horror movie, so it wasn’t all bad, haha! Oh wow, this sounds like such a sweet yet suspenseful romance with a mystery attached! Aside from loving the cover, I find myself really interested in the synopsis of this one. I’m going to have to check this out. I’m glad to hear that you enjoyed it. Great review, and thanks so much for putting this one on my radar! Yes! It had a lot of elements that I love, and the romance never felt out of place like it can do in some mystery/thriller novels that I read. I’m so glad you’re interested in this one, Kelly! I hope you like it if you do get around to reading it :) Thank you, an my pleasure! What an intriguing book! I am personally not into creepy books, but I do love adorable romances and being kept on my toes. Plus, the whole flashback-flash forward concept has always intrigued me. I like trying to piece together the mystery on my own. Were you able to see the ending coming? It is not overly creepy, so I think you would be okay if creepy is not your thing! There was a lot of piecing together that was done while I was reading it – I actually talked it out with someone because I couldn’t keep it to myself! Eventually I did see the ending coming, but not until just before it happened, which was great. This book definitely sounds like something I would enjoy. I like all the reasons you listed. Thanks for sharing your honest opinion! Aw yay! I hope you give it a try, Karen :D And my pleasure! Ooh this sounds like one I need to read. I like that it’s creepy and keeps you guessing – perfect for the fall! I also like that there is a bit of romance, but it doesn’t overtake the rest of the story. Thanks for sharing. I definitely recommend this one to you, Lauren! I think you would like it a lot :D Romances that overshadow the mystery aspect of books like these disappoint me so I loved that this one was on the subtle side. If you do end up reading it I hope you like it!